I went on walkabout this morning at Sandy Point State Park. The TPE color forecaster claimed that there would be some color upon sunrise. Well, TPE was completely wrong and it was not only lackluster, it was completely dark when the sun rose upon the horizon. But when I drove into the park at dark, at the entrance I saw a bunch of deer and some were smaller than others. So I backtracked to where they were. 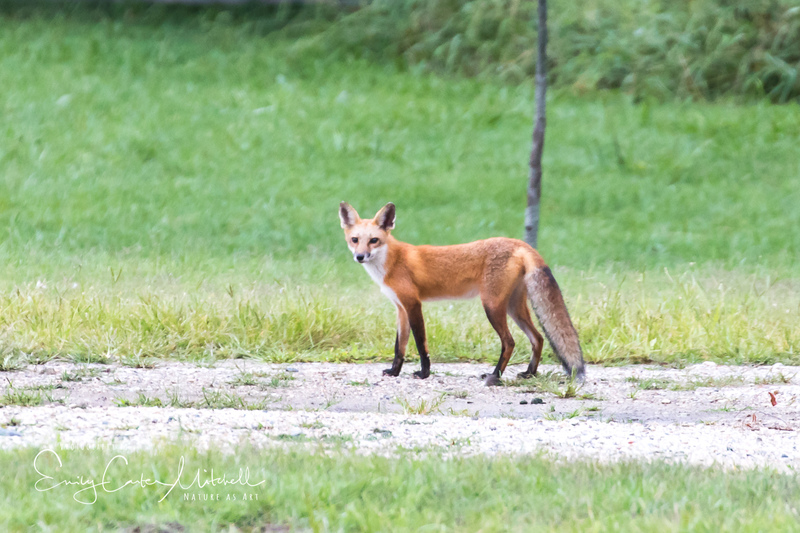 First a lovely fox ran across the parking lot and off into the woods. He looks well fed, and later when I walked the beach I was able to find the fox’s footprints and where he grabbed a gull for supper. Arriving to where I first saw the deer, not only was there one fawn with spots, but two. I had planned ahead before I reached them. Putting the windows down so that I could photograph from the car, I slowly creeped up to them with my really big SUV. Well, hard to hide in this monster. As with a good number of wildlife, at first they are startled with your arrival. If you wait long enough they settle back down and continue what they were doing. The Mama deer kept their eye on me, not overly concerned but having a watchful eye in case they had to give the alert signal. While I was sitting there enjoying the pair of fawns, I looked to my left and saw another doe with two more fawns. How could it be? As if two were a miracle enough. Leaving that family to their grazing, I stayed with my two to hope for a closer capture. Not wanting to overstay my welcome, I got a few shots and turned around to go back to the beach. BAM ! There is another doe and fawn family. 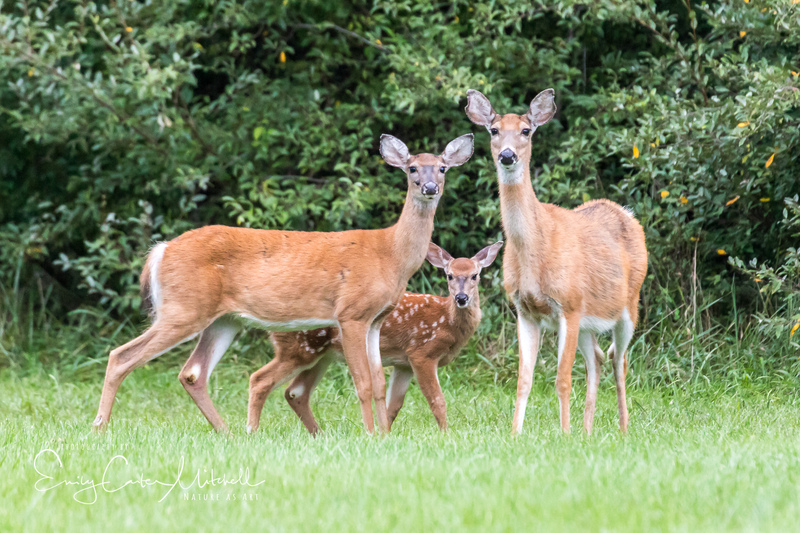 This grouping had three fawns with spots. I needed a different lens than the 500mm which is what I was shooting with, so I went into another parking area to get out of the car to get the other camera kit. And the fawns continue! At least three more were seen here and who knows how many more were keeping their eye on me. It was difficult shooting conditions as there was absolutely no light whatsoever. Shooting with the Canon 5D Mark IV and first the 500mm f/4, then the 100-400mm f/5.6 L ii lenses I had to embrace an ISO of 5,000 to achieve the slow shutter speed of 1/125 of a second at the widest open aperture. Luckily deer tend to stop and stare before they bolt off. Lightroom did a nice job of reducing the noise in these images, but it also creates a softer result overall. 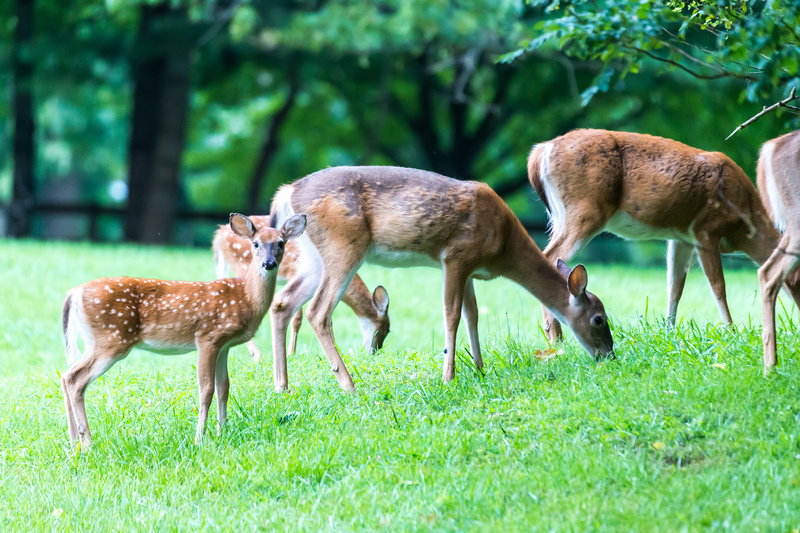 But still…NINE DEER !!! How cool is that? They are always such a fantastic view, aren’t they? We still have two fawns in our garden every day. Oh you are so lucky Pit. Do enjoy them as much as you can. Yes, we certainly are lucky here. The deer we have in our yard were one of the reasons why we bought this property. And we try to attract them with some corn every day, even if having deer in the yard means that we can’t plant everything we want, and that there will be some damage once in a while. But we gladly accept it in exchange for the fun we have watching them, especially when the young ones are frolicking [http://tinyurl.com/gmyuqso]. Thank you for sharing this link Pit. Awesome pics and film of the deer. Lucky you. You’re welcome, Emily. I’m glad you liked the pictures and videos. We’re indeed lucky to have the deer around. Liek I said: even if they do some damage sometimes. Emily I always enjoy following your travels… keep up the great work. Thank you very much Jack. I sure will! Aw I just love deer! Very cool! And the fox and its dinner: super cool!